With less than a day to go before Apple's next event, we're getting even more rumors of what will be released and some are coming with persuasive evidence. AppleInsider takes a skeptical look at what Apple will likely reveal, what it might show, and what it probably won't at the New York event. Just a few weeks ago, the question was whether Apple would hold an October event at all. Based on previous years, it looked likely but there was a strong chance the company would confine itself to a few press releases as it did in 2017. Now we're not only on the eve of an event but if rumors are correct, it will be an even bigger one than the iPhone launch in September. The rumors are not correct. Not all of them. Apple isn't just good at making hardware and software, it's really precise on when it chooses to announce them. In recent years it's proved to be a little less with the actual release -- so many devices from AirPods to AirPower have slipped considerably -- but they know how to put on a show. Apple wants attention and it will not pack an event with so many new products that it dilutes their impact. Equally, though, no firm will bring a device to manufacturing and then sit on it. Apple is very strong on anything logistical, so if there's evidence that something is being made, it's likely that it's about to be released. It just isn't definite. 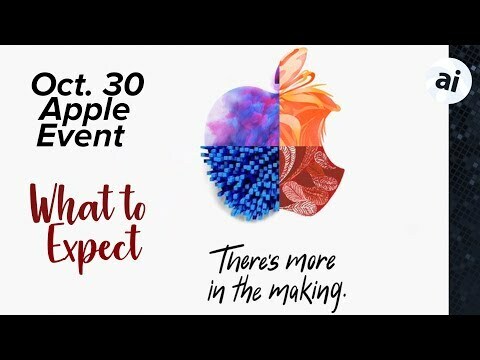 So while we wouldn't be surprised if Apple still holds back some items for a later press release, this is what we expect to see at the October 30 "There's more in the making event". This is not unsubstantiated rumor and it is not a wish list: this is what strong evidence tells us. Based on Apple's arty invitations featuring 370 different renditions of the company's logo, this is an event that will at least partly concentrate on creating art with Macs and iOS. Perhaps unsurprisingly, then, the very latest rumor with evidence behind it involves the Apple Pencil. Developer Guilherme Rambo claims to know the model number for the Apple Pencil 2, B332. He says "the user will be able to change stroke properties by sliding along the sides of the pencil." He's backed up by another developer, Steve Troughton-Smith, who reports finding new code in iOS called UIPencilAdjustmentInteraction which has various states that note whether the user has tapped or slid their fingers on the Pencil. If the event really does concentrate on creating art then it's ironic that rumors about the iPad Pro have just been substantiated through a drawing. As with the UIPencilAdjustmentInteraction discovery, this was found within the released iOS 12 code. Among the icon graphics within the new iOS there is one for an iPad Pro which has narrower bezels and seemingly no home button. These details fit what has previously been claimed through leaks, supply chain evidence and chiefly through reports by analyst Ming-Chi Kuo. He is just one source yet his information about previous Apple releases has been consistently correct. Kuo is reporting that there will be new iPad Pro models that adopt the iPhone X style of display with no home button, greatly decreased bezels and support for Face ID. Guilherme Rambo, writing this time in 9to5Mac, reports finding evidence for Face ID on iPad within iOS 12's code. "Face ID needs to be in portrait to learn how to recognize you," say text embedded in the code. "After Face ID has been set up, it will work in portrait and landscape." There are also claims that the iPad Pro will move its Smart Connector and drop Lightning in favour of USB-C. The idea that Apple looks to be moving to adopt USB-C more was given a boost lately when the company released an updated Apple Watch charging cable that uses it. Also newly rumoured is a claim from Bloomberg that the new iPad Pro will be the first to include graphics hardware designed by Apple. Kuo further claims that there will be an update to the iPad mini. That's surprising when the iPad mini feels like the forgotten, orphan product. And also when the iPhone XS Max appears to have functionally taken the place of a small iPad. He is, though, hedging his bets on this one and says we may not see the refreshed machine at this event. At least the rumors that we'll see the new Mac Pro this year have died down. Still, if you want a Mac mini, an iMac, an iMac Pro or a MacBook, then there are wishful rumors to suit. We really expect that some of this will be held back to press release some day soon, but this is what it looks like Apple could elect to show us. Regulatory filings from the Eurasian Economic Commission, where Apple and other firms are required to submit details of new hardware, suggest that there will be four machines. It actually says that there will be revisions to current models but those appear to be simply the addition of macOS Mojave as the pre-installed system. Four entirely new models appear to include three desktops. Given recent screen shortages for iMacs, it's a reasonable bet that two of the three are revamped 21 inch and 27 inch iMacs. That leaves one desktop and one laptop. It's recently been claimed by Ming-Chi Kuo that the desktop will be an updated Mac mini but there's scant other evidence. Tim Cook did tell a customer that "we do plan for the Mac mini to be an important part of our product line", but he said that a year ago in October 2017. It's now been more than four years since the Mac mini got an update so it's certainly possible but this hasn't had anything like the sheer volume of reports that the laptop has. This fourth new Mac is expected to not only be a new MacBook, but in some way a cheaper one. Apple doesn't do cheap, but it does do cheaper. Just as it has managed to make us regard the iPhone XR as being the affordable model, so we should expect to see a MacBook that costs less than the current models yet more than we might hope. If it's genuinely cheaper than all the rest then that would put it as retailing under the $999 of the MacBook Air. 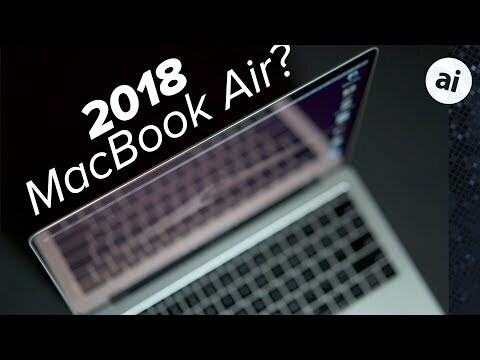 That Mac does seem tired compared to the newer, sleeker MacBooks and the more powerful MacBook Pro models, so it's possible that this will be a refresh and the MacBook Air name will continue. All of the rumors about the October 30 event concentrate on new Apple hardware but there is software coming and much of it should be released then. Some like tvOS 12.1 have no apparent new features while both macOS Mojave and iOS 12 are going to re-introduce the long-promised Group FaceTime facility. This video conferencing feature was promised for the original releases of both the Mac and iOS systems but was pulled shortly before release. It's also expected that there will be an update to Siri Shortcuts in iOS 12.1 will make it easier to manage large numbers of shortcuts. Will it be a glitzy release of latest & greatest features? Or, will it fill in gaps and deficiencies in Apple's product lines that will make (normal) people's lives better? While I doubt it will be all of one and none of the other, I am hoping that it has enough of the latter to keep me hopeful for the future of Apple. The way they have been treating the iPhone, iPad and the Apple Watch in recent years keeps me hopeful that they will keep the Mac line relevant as well. It makes sense to move charging cables from USB-A to USB-C since all of Apple's desktops now use USB-C which can be used to charge iOS devices. That has nothing to do with replacing the Lightning port on iOS devices. What I think there's a misunderstanding - Apple is probably including a USB-C charger with an iOS device for the first time along with a Lightning to USB-C cable. This is a first step in removing support for USB-A type ports on all their devices and not removing support for Lightning. I'm hoping for just two things: a new iPad mini and a new Mac mini that's got significantly better performance than the previous mini. The biggest question for me is will there be a new sub $1K laptop and if so what will it be replacing. If Apple announces a sub $1K laptop with retina screen there will be little to no reason for the rMB to exist. I’m hoping whatever they do will finally bring clarity to the low end of the laptop line. I’d love to see them do what they did with the $329 iPad and announce something that really was competitive price wise. Something that would be the ultimate laptop for schools/college. I’m hoping sub $1K doesn’t just mean $999. USB-C offers too many advantages for Apple to stay with lightning on the iPad. The real question is will Apple keep the port open on iPad or will they lock it down like they do Lightning. If they lock it down they will basically dismiss some of the biggest advantages of USB-C. Beyond that hat people should not forget the big influence Apple had on the USAb-ac spec. Apple literally drove some of the specs features. As such I believe USB-C has always been Apples long term goal on as many products as possible. In anyevent just just a few days to go. Don’t forget that there was the discovery of iOS support for these new iPads to drive 4K video. From what I’ve read, which is not all that much, the current lightening port can’t do that. Also, it would make sense to spec these iPads as pro devices by switching to the usb-c connector on the iPad. That said, I’m not going to like having to bring 2 different charging cables with me when I travel if this were true. Hopefully that will be mitigated by an adapter. This event will mainly be about iPad Pro and "Pencil No.2". I'm guessing these two new products were given to artists to create the stylized logos in the invitations using software updated for both. If the iPad mini shows up, it'll have the same specs as the current iPad (including support for Pencil 1.0), but smaller and priced at $279. MacBooks will see a shift; Air is shown the door. Current MacBook moved down in price. Current 13" MacBook Pro (with function keys) removed from "Pro" status. All "pro" models will have a True Depth camera system (Face ID support) and a new TouchBar (sans Touch ID). Specs updated across the line. Would a sufficiently more powerful iPad mean we might get a sufficiently more capable iOS for that iPad? One hopes (and no, I don’t mean taking a step backward with mouse support and an MsDos file system). What advantages does USB-C offer as a port interface that Apple can't do with USB 3.x and Lightning on the iPad? I see an argument for Apple giving the iPad Pro a dual UI so that offers both iOS for iPad and a Mac-like UI when you plug it in into an external monitor )with a mouse and keyboard). I think this could both help iPad sales and give people a taste of the Mac which would in turn help Mac sales seeing as how powerful their A-series chips have become. If that's the case then I can see how USB-C might be a preferred step over Lightning to match the Mac, but I don't see what specific advantages USB-C on the iPad has over Lightning when we're just talking about a general iDevice. This is a nice list and frankly it is in Apple. best interest that as many of these speculations come true. This especially in the case of the neglected Macs. I’ve been on the band wagon for ten years now and just recently have been running a Linux based machine. Mainly for performance that modern hardware allows. That and Apple hasn’t left me with the warm fuzzy feeling that they give a hoot about the Mac. I’m safe in saying many others have the same feelings. While i I know this puts me in the minority I’m really hoping that Apple has ARM based Mac Books and Minis in the wings. The Mini because I will never buy the current iMacs and the Mac Prois stupidly expensive for my needs. It it is the Mac Book though where an ARM based chip, especially Apples bleeding edge tech, would be absolutely wonderful. We could easily see battery life for days at a time. It would even make sense for Apple to put a few solar cells on the device to supplement battery life. Done right the Mac Book could become a better travel device than the iPads. This especially if said Mac Book had built in features to support running iPad software. What has me drawn to this idea of an ARM based Mac really comes down to Apple being the only company really in a position to pull off competitive ARM based machines. In the case of the Mini I can see home server duty with idle power of less than a watt. So the advantages of ARM don’t rest with just laptops, rather the power profiles Apple can offer are ideal for many Mac Mini installations. Both of these are based on assumptions that Apple is incapable of updating Lightning to support USB 3.x (Lightning currently supports USB 2.x), which his much more important than supporting USB-C. USB-C is just a physical port. Apple could reveal Lightning 2.0 that splits the 8 contacts into 16 (allowing for more data lanes, i.e. higher bandwidth), but also make it backwards compatible with Lightning 1.0. (similar physical connector and port). Anyone who needed USB-C would simply buy an adapter. iPad is the best selling tablet on the market, Apple is not going to give up Lightning licensing revenue - 3rd parties will support and pay for it just as they always have. Agree. I think Apple is very supportive of USB-C but, "releasing a USB-C version of its Apple Watch charger" is NOT evidence of a move away from Lightning. The Watch charger doesn't use Lightning today. The release of the USB-C cable for the Watch is a continuing sign of support for USB-C.
With lightning charger cables littered throughout the house because I hate having to lug charging cables around this might be welcome assuming I could charge the new iPads with the older cables. I’m certainly not on the usb-c bandwagon but I’m also not going to get myself worked up if the new iPads come with a usb-c charging port either. Note, I don’t have an Apple laptop (yet) so that’s not an issue with me. Yep. Apple already sells a separate 29W USB-C charger to fast charge the 12" iPad Pro, which currently supports USB 3.0. That was a first step. Second step is to upgrade Lightning to support 3.x and include that charger in the box. A model sorely lacking in the current lineup is a reasonably priced 15" laptop. Want a 15" Mac laptop right now? It's only available in the MBP w/TB and that'll be at least $2399 US (ignoring sale items, refurbished, etc.). ADDING mouse support would be a step forward not backward. It would remove the constraints that block the iPad from being what Apple promised it to be: a real computer. It will be there in time. It's when, not if. I thought the same thing, but then iOS 11 and 12 came out. With them Apple introduced some very clever ways to do things on the touch screen without a mouse. Text editing for one has vastly improved. Yes there are some things where I need my Mac with a mouse and keyboard, but they are getting to be fewer and fewer. If we had an option for an extended screen keyboard with arrows, function keys, and a number pad, I think I could do nearly everything I need on the iPad without a mouse. Yes, all true. But there are things that these fat fingers of mine just cannot do easily or well. Selecting fine text & copying & pasting -- or cells on a spread sheet -- is one of them. But, ultimately an iPad with an external keyboard that lacks a touchpad is no better than a touchscreen laptop without a touchpad. Following the rollout to over 11,000 iPads to the 2018 freshman class, Ohio State University has started to see the benefits of their ambitious program including improvements in grades, higher campus engagement, and the eventual savings of millions of dollars for students. "This unique program will give students access to the incredible learning tools on iPad, as well as Apple's new coding curriculum that teaches critical skills for jobs in some of the country's fastest-growing sectors," Apple CEO Tim Cook said at the time." I'm thrilled the broader central Ohio community will also have access to coding opportunities through Ohio State's new iOS Design Lab." IMO, the iPad Pro would be great for [heavy-lifting] code development if it could run Xcode with an external keyboard/trackpad case. Should Xcode be ported to the iPod Pro (if it isn't already running there)? Should macOS be ported to the iPod Pro (if it isn't already running there)? ...typin' this on my iMac 5K, while listening' to David Bromberg singing "I like to sleep late in the morning" in stereo on paired HomePods... Nice! What is the purpose for MacBook Air? I can say it became useless when 11 inch was dropped. Most of people will buy Macbook or Macbook Pro. Apple overslept need by looking on the sales numbers probably and did not relaize that smallest portable computer that has Retina display and a bit more powerful CPU would be a good choice for some users. I had one as well, but now whne I see there is no vision to it and it is just some pointless squeeze between MacBook and Pro with limping hardware and no size advantage I will not buty it and many will not. This may be a looser just as Mac mini with reduced number of cores comparing to older versions and limiting multitasking users (ity is not about of power on one test or single application). On to pf that this USB-C connector for all garbage that works intermittently and you can trip on damaging one or another thing without magsafe. That ain't computer for your desk for Pete's sake and some of us used that in some very unfirendly environments when it was designed for that type of traveller and active person.